We are deep in the Division III football offseason. It’s already been more than 90 days since we crowned Mount Union national championship and it’s more than five months before we restart. Spring practice is getting started, at least in warmer climates, and there are still some open coaching positions and some 2018 schedules left to finalize. We’re curious about what the Stagg Bowl will look like in 2018, and as it turns out, the NCAA committee is waiting to hear some details as well. On this edition of the D3football.com Around the Nation podcast, we chat with new Washington & Lee coach Garrett LeRose (@coachlerose on Twitter) about taking over the position as a 2007 grad of W&L. 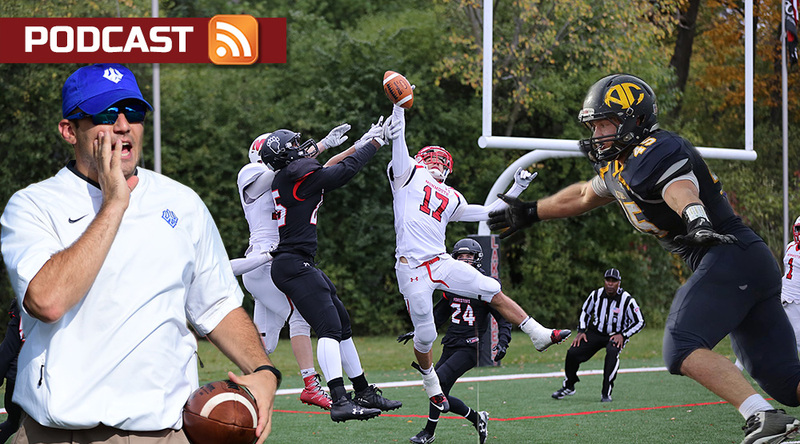 Lake Forest coach Jim Catanzaro (@LFC_Football) chats both about his program and his position on the football NCAA committee, including how they make the last at-large picks and what we might expect at the Stagg Bowl in Shenandoah, Texas. And we chat with Allegheny coach B.J. Hammer (@CoachBJHammer) about rebuilding that once-proud program, the 1990 Division III national champion, as well as what he learned from his last head-coaching job. This entry was posted in Around the Nation and tagged Allegheny, Lake Forest, Wabash, Washington & Lee, Wheaton, Whittier. Bookmark the permalink.